If there’s one thing I try to avoid, it’s being pegged as an American. It’s not that the French have low opinions of Americans……………….necessarily. It’s just that sometimes I have a low opinion of Americans. Especially when they’re interacting with other people in foreign countries. There are so many nice people to meet here, but honestly, some of the trickiest situations come up when I meet other Americans. There is one woman I met (who has lived here for many years), who actually said to me, “Are you one of those Americans who is trying really hard to speak French because I’ve lived here for years and I’ve found that you can get around fine without really knowing any French at all.” It’s hard to know what to say in those situations and it kind of hurts me to hear things like that because I can’t help but wonder why anyone would have that attitude. I’m not going to lie, learning a foreign language at any age is not easy, but it gives you a better window into a culture than just looking in from the outside. It also gives you an incredible amount of empathy for people who are forced out their home countries and have no choice but to assimilate into a different culture. I am sure it’s harder work than most of us will ever know. So now that you know my feelings about Americans abroad, you can hear my story about dinner the other night. On the first night of school each year we have a tradition that we go out to eat as a celebration of surviving the first day. In Vermont, the restaurant choices were easy since most of my favorite restaurants are the same as my kids’. But now we live in France. Let me just start by saying that although the French like to eat out as much (or more) than any culture, there is virtually no kid/restaurant culture here and kid’s are not necessarily welcome at restaurants. It’s nearly impossible to find a restaurant with a high chair, let alone straws or plastic cups. We have friends here who lived in the US for a few years before moving back to France when their kids were little. To combat the anti-kid culture, they would keep a high chair in the trunk of their car in case they wanted to got out to dinner. If you’re looking for a restaurant with crayons, you may need to hop a plane back to the US or a least remember to shove some in your purse. For all of these reasons, most French kids eat at home. Our kids have eaten out a few places, but not many times, so when it came time to decide where to go for the first night of school I started pushing for the Japanese restaurant. Sadly, for me at least, the kids had their eyes on another restaurant. It’s called Buffalo Grill. Buffalo Grill is a big chain restaurant in Europe with a distinctly American theme and feel. It’s big and red and has giant Texas-style horns on the roof of each restaurant. In a land of crepes and foie gras, it is absolutely screaming “America!” Just the kind of place I would like to avoid. As a side note, there are no buffalo in Europe. I was pushing hard for Japanese, but the kids pushed even harder for Buffalo Grill. Tim finally had to intervene because it was turning into a showdown. The comment that finally broke me down was Tim saying, “At least they don’t want to go to McDonald’s.” Good point. So off we went to Buffalo Grill with me secretly hoping that I would not run into anyone I knew. I was hanging my head as I crossed the threshold into mini-America. As we entered, the wait staff looked at us and smiled. They even kind of shouted, “Bon Soir,” to give us an American-style restaurant welcome. Once we were seated, the kids found some giant fake American Indian headress hats to put on. They were like the Burger King crowns but even bigger and more ethnically questionable. Minus the country music, it was the most fun we’ve had at a restaurant since arriving – and the food was good too! As the night went on, I started to feel less bad about my presence at Buffalo Grill. I think the giant beer may have helped. I was having so much fun at dinner, I barely noticed a family we knew from school enter the restaurant. The parents of this family are no nice but slightly intimidating, in a European way. She is beautiful, always tan and never without 5″ stilettos. He is fit, super friendly and always wearing a beautifully tailored suit. They have a summer house on the southern coast of Spain and ironically, they are also the previous tenants of the house we’re living in. This family clearly noticed us and stopped by our table to say “hi,” before sitting down to eat. I was stunned. This fabulous family at the Buffalo Grill, doing mazes on placemats and wearing giant fake feathered crowns??? Suddenly my entire opinion of Buffalo Grill changed. If it’s good enough for them, damn it, it’s good enough for me. While we were at the Buffalo Grill, it would have been easy to forget we were in France for a moment, except that the occasional dog barking inside the restaurant reminded us that we are not in America any more. At the end of the dinner, the server wrapped up the uneaten half of Eamon’s burger for him to take home, a concept you could never find in a real French restaurant. I guess there is something to be said for American-style customer service. 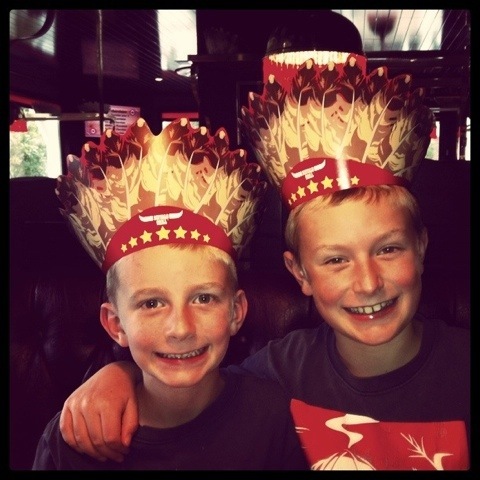 This entry was posted in food/drink and tagged americans in france, buffalo grill, first night of school. Bookmark the permalink.